There is a clarification from USCIS, the US Federal Immigration Agency that H-1B Visa Holders, can work for more than one employer, but they are required to have, an approved I-129 for each of them. The H1B is categorized, as a non-immigrant visa, permitting US-based companies to provide work to overseas workers in specialty occupations requiring technical/theoretical expertise. 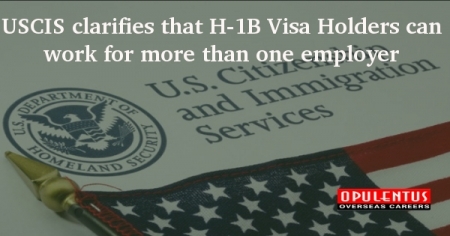 Technological companies rely on H-1B Visa to sign up many employees every year from various countries. The New employers are required to present an I-129 application before beginning to work. Form I-129 is related to a non-immigrant worker and is given to the USCIS. It is used by employers, for obtaining or amending the details of workers employed on a non-immigrant visa. The H1B visa comes with a yearly cap of 65,000 visas, each financial year, as authorized by the Congress. The initial 20,000 beneficiaries, who have obtained a master's degree, or any other higher degree from the USA, are exempted from this cap. Moreover, H1B employees that are required by or employed in a higher education institution, or its affiliated/related non-profit entities, or in an organization engaged in non-profit research or in a government research organization are not included in the numerical cap. In the meantime, the Cato Institute, an American, expert body providing ideas, has said in its report that in 2015, more than half of all the employment-based green cards were given to the workers’ family members. Only 44 percent were given to the workers. In case the members of the family are exempted from this quota or a separate category of the green card was made for them, 76,700 top skilled foreign workers would have received the green card without resorting to increasing any allocation. The institute further says that in 2015 85 percent recipients of an employment-based green card were living legally in the country. They succeeded to adjust the status of immigration, from an H-1B or F visa to the employment-related green card. Making an Exemption of these adjustments of position, from the cap of a green card, would increase the numbers, of top skilled workers qualified to enter. Tsion Chudnovsky, an Immigration Attorney stated that lawyers today witness a major change in the method in which visas are processed. It is feared that denial rates may go up to 40 percent in the H1B cap in this year. To find out if you are eligible to Immigrate to USA fill out a free evaluation form or contact us at [email protected] or call us 7207111222. One of our experts will meet your expectations and provide answers to queries.